Later this week, we'll be heading up to Manchester-by-the-Sea for our hometown’s most celebrated holiday. On the 4th of July, the day starts with an impressive and festive parade, transitions into spreads of tantalizing barbecues, and ends with a standout fireworks display. We always enjoy seeing old faces and nibbling on some classic all-American fare. The 4th is also the one day of the year where we indulge in a crispy hot dog straight off the grill. Classic mustard, ketchup and relish are a stellar trio, but this year we’re going to step up our condiment game with some inspiration from last summer. Our close college buddy, Katie, is a grilling connoisseur and resource for all that is beachy and nautical. 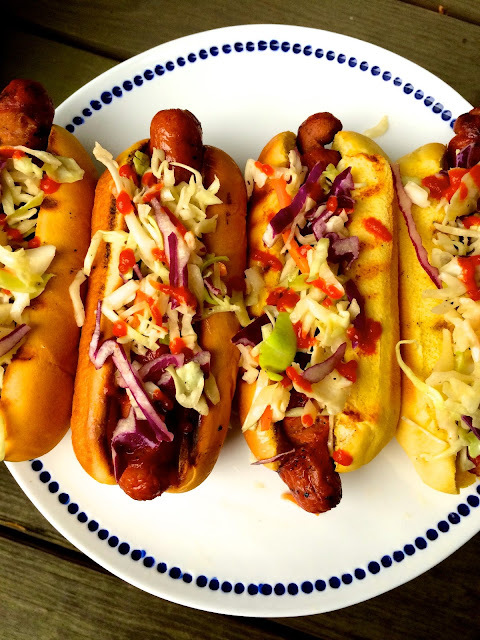 Before a weekend trip to the Hamptons last year, she grilled up hot dogs covered in a sweet and tangy slaw and drizzled with sriracha. They were pretty unforgettable. We’ve tweaked the recipe a bit and are also planning to kick the hot dogs up another notch by spiral-cutting them. We first saw this new trend for summer in Food and Wine which allows for a better crisp and more crevices for all your yummy toppings. We cannot wait to share these this weekend! Preheat gas or charcoal grill to medium high heat. 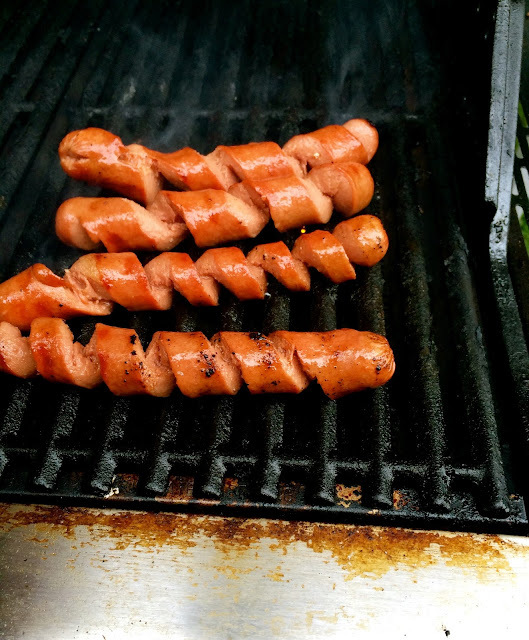 To spiral-cut the hot dogs: Insert a grilling skewer into the middle of the hot dog and slowly push the skewer through the center. Place the hot dog on a cutting board and using a paring knife, start at the tip of the hot dog and cut down at a diagonal until you hit the skewer. Continue cutting at a diagonal, spinning the hot dog as you go, until you hit the bottom of the hot dog. Pull the hot dog off the skewer, and they are ready to grill. In a large bowl, mix the peanut butter, oil, vinegar, lime juice, sugar, salt and pepper and whisk vigorously. Add the slaw and toss, making sure the dressing coats every veggie piece. Place the hot dogs on the hot grill and turn them occasionally to get grill marks all around. Grill the buns to your liking as well. To assemble, place a spiral-cut dog into each toasted roll. 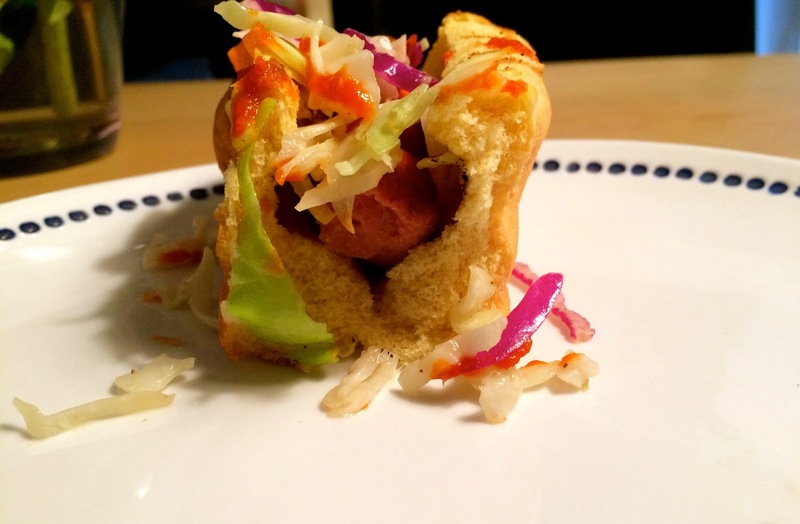 Cover with a liberal amount of slaw, and top with a drizzling of sriracha- the more you add, the spicier it will be! Repeat with the remaining ingredients.